What if Spider-Man fought in Vietnam? Orc Stain and Wonton Soup creator James Stokoe turns his incredibly detailed eye on everyone's favorite wallcrawler, placing him far from the supervillain-filled streets of New York, and casting him as a masked soldier in the short comic "Spider 'Nam." On his Twitter acount, Stokoe also reveals his plans for this, should he ever finish it (which isn't likely). 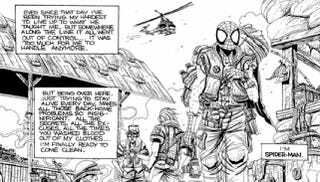 According to Stokoe, "The Spider-Nam pages I posted isn't the whole story. He still has to slog to the Cambodian border to find Curt Connors." Also, there will be "M79 web launchers, Marvel character racial tension & cynical stabs against Captain America! That oughta make it completely unpublishable!"